Nozawa Onsen (野沢温泉) is one of the popular Onsen village located in northern Nagano prefecture. There are many hotels that have Onsen. Also, there are 13 different public Onsen you can enjoy as well. They have 100% pure Onsen spring water. In the center of the town, there are many restaurants and bars. Nozawa Onsen also has a great ski resort. The history of Nozawa Onsen begins around 724 A.C.E. There are many hotels with Onsen and 13 different public Onsen. 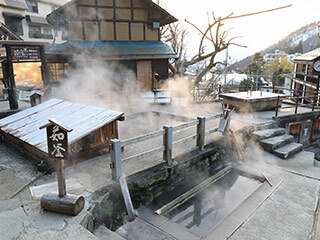 Those public Onsen are free and you can check out all different Onsen after Skiing. There are many bars and restaurants around the main street of this onsen town.